After months of testing the murky waters of political representation in the Roseau South Constituency, Attorney-at-law Joshua Francis has finally plunged in. He's now wet from hair to toe nail. 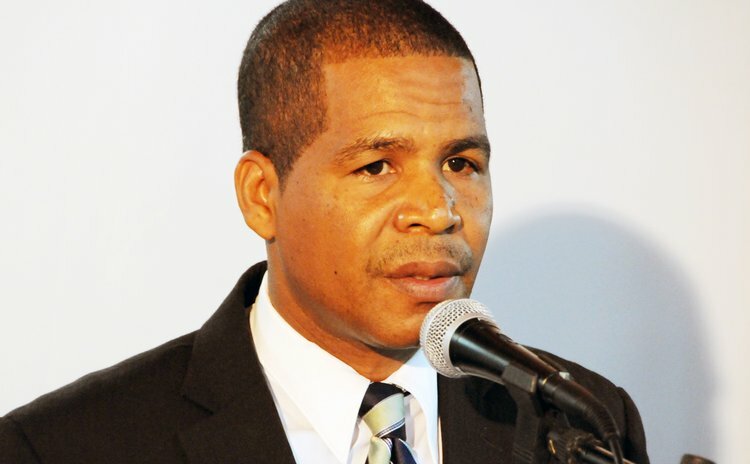 Last week Tuesday Francis declared that he will definitely run on a United Workers Party (UWP) ticket in Ambrose George country, the constituency that stretches from Silver Lake to Loubiere, in the upcoming general elections. George, the deputy leader of the ruling Dominica Labour Party (DLP), now has someone to aim his barbs at. Francis, a qualified economist and former school teacher hinted for several months that he was considering the possibility of contesting the seat. On Tuesday he made the crucial announcement at the Loubiere Resource Centre flanked by supports and executive members of the UWP. "Today November 27, 2013, it is with great joy and with a sense of humility and patriotism, I confirm to you that I will be the UWP's candidate for the Roseau South in the upcoming general elections," he said. "It has been a long time in coming, but today, change has come to Roseau South. Roseau South deserves better; Roseau South can achieve better…this is our time, this is your time. This is not about party politics and politicians. This movement is about us, not just a few of us but all of us," Francis stated. He suggested that it must no longer be politics as usual; and it was time that we put our people first. "This is a time when all Roseau South constituents, from every walk of life, must unite in our resolve for peace, economic security and justice. We must go forward to support all that is good, just and proper," he said. "The time has come for us to turn a new page in Roseau South's history by righting the wrongs for the past and so moving forward with confidence in the future". The road ahead, he said, will be long and there "may be setbacks and false starts, but with your support, yes we can, and I will always be honest with you about our challenges we face". "I will listen to you especially when we disagree. Above all, I will ask you to join in the work of building Roseau South block by block, brick by brick, hand in hand we will build Roseau South. "I place on public record that I am ready to work with all interest groups, churches, clubs and village councils. So let us summon a new spirit of patriotism of service and responsibility where each person resolves to pitch in and work hard and look after not only ourselves but each other," Francis stated. It was time, he noted, to strive to rise or fall as one nation, as one people. "Let us resist the temptation to slip back to petty partisan politics that has poisoned our politics for so long. Let us lift our eyes beyond the failures of the past and of today, to the hope and promise of tomorrow. Let us be courageous, fearless and faithful as we walk into the future-better days are coming and let us never fear to change for the better," he stated. UWP leader Lennox Linton welcomed Francis into the "fold" and pledged to work "hand in hand with him" to win the seat. Linton described Francis as a "hard working, committed and honesty individual" and thanked his family for allowing him to be part of "Team Dominica." Francis is the latest candidate declaring for the UWP as it prepares to battle with the DLP when the next election is called. General election is constitutionally due in 2015 but Prime Minister Skerrit has hinted on several occasions that he may name the election date sooner.